this one pretty dirty and scrapped up... can you repaint engines? do you need a special paint? I go to the auto paint store, if you do get paint for the engine get the highest temp paint possible. damn thats sweet what did the super truck sale for? I've done a few engines with high temp paint and they turned out real good. Depends what brand you use I went to a Pro Paint store were professional auto painters go. I've never had a heating problem after painting my engines, but if you feel uncertain about painting your engine then dont. This was just from my personal experience. I sold the truck as a roller about a year ago.. I took out the OS engine and put back in the original one, threw in a spare 18 cen motor and put on the stock tires.. Sold the truck for $125 and sold the 2 OS 18 engines for $85 each used.. The truck was in great shape and the cen engines were just rebuilt.. 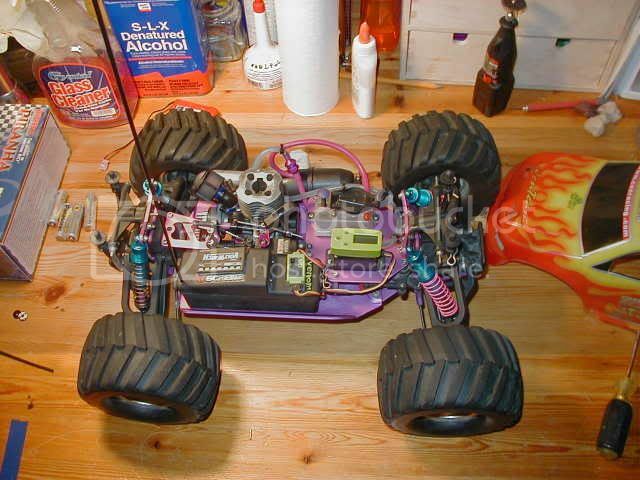 The OS motors only had about half gallon of fuel thru them.. Had a ton of spare parts that I thru in with the truck as well.. somebody got a great deal on that one..
hey i got the same truck it was great until the gears striped then i lost my glow igniter then the pull start went up its just something about nitro. i am looking forward to see what you do with it! I`ve got a similar story^^. I`m really interested in this build, i hope i can givbe you a dig out... good luck! Airsoft!! when I was a kid we used real bb guns and shot the hell out of each other. What the hell is wrong with the kids these days you might as well lock them in a padded room, hell you can't even give them a fork to eat with they might hurt themselves. Man, everytime I see a thread about the olf Fun Factor i really miss the days of trying to work out how to fit a big block, compatible cvds and all the other stuff. Some great trucks came out of those threads!! Some useful upgrades for your FF would be aluminum brake seat, heavy duty diff gears (crown and pinion), plumbers compression fittings for your diff cups, DrHondas shock towers with two pair of Matrix buggy front shocks, New Era Models roll cage is a great addition aswell if you can still get them and a full set of cvds. These cars are fantastic vehicles and massively underestimated by the general r/c population. If the old issues with the drive and diff cups have been sorted, then these things will just keep on going. The Fun Factor is a cool buggy / truck in the day and now. It was so light and fast. 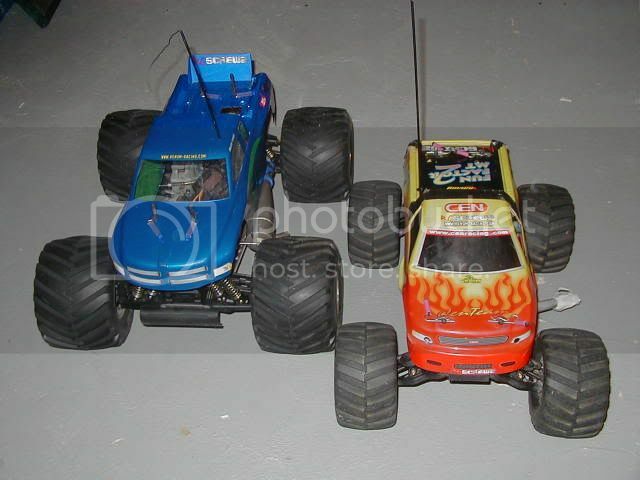 I beat alot of 1/8 monster trucks and the look of the drivers were like Wow that things fast. That Nt .16 engine just purred, the idling was the best of engines. The name of the truck Fun Factor is a perfect name cause it was loads of fun. Couldn't agree more. The little FF used to blitz most of the other cars out there whatever scale. 45mph was attainable out of the box and with a few easy mods and some well chosen hop ups, you could quite easily get the speed top closer to 50mph. I wouldn't mind picking up one of the newer Talon/Magnum cars to see what they are like but to be honest, I have the FF set up just right and the little NT16 is a fantastic little mill and I don't really need anything else. I have a race coming up that is in aid of Cancer Research as a benefit to one of the racers who passed away. 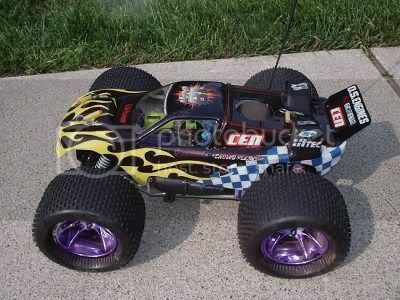 All the cars there will be 1:8 buggy or truggy but I have decided to run the CEN in that meeting. See if the old girl can still scare the big boys! !